The transport sector is blasting the Government over regulatory-enforced inefficiency and a system of road charges it says are damaging the economy. A study commissioned by the Road Transport Forum NZ said the operating costs for articulated trucks were 38 per cent higher on a tonne kilometre basis in New Zealand than Victoria, Australia and 27 per cent higher than Tasmania, while truck and trailer costs were 36 per cent higher than in both states. Road Transport Forum chief executive Tony Friedlander said the Government apparently wanted to ignore the fundamental importance of efficient freight transport to the cost of living and its economic contribution. 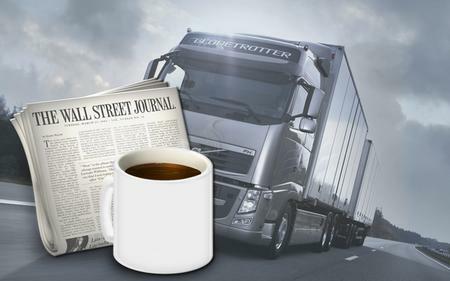 "The Australians are continually improving the productivity of their road freight industry because they understand they need to build their economy on efficient transport, yet the New Zealand Government is happy to preside over ongoing inefficiency and waste," Friedlander said. "It's no wonder New Zealanders' income levels are falling further and further behind." The report said the two main reasons for the difference in freight costs was lower road tax for trucks in Australia and an ability to carry heavier loads. "These extra costs are directly born by New Zealand consumers and businesses," Friedlander said. New Zealand's road user charge system under which diesel trucks do not pay tax at the pump but rather buy road usage in advance was complex, with high administrative costs and levels of evasion, Friedlander said. "We believe there is a waste of anything of up to $100 million a year in the road user charges system." The forum would like to see the system replaced with a fuel tax, as used in Australia. "This is not a case to say charge us less. We need better roads around New Zealand, we're prepared to pay our fair share of those." The same amount of money could be raised but with less waste, he said. "The industry has proposed moving to a fuel tax but the Government is sitting on its hands." A truck and trailer covering 100,000km could pay about $45,000 to $50,000 a year in road user charges. However, a regional tax for diesel fuel proposed to come into force in July 1 could potentially add up to 10c a litre to costs, Friedlander said. Meanwhile, allowing trucks to carry heavier loads would improve efficiency and cut costs, he adds. According to the report a single articulated lorry could carry 39 tonnes in New Zealand but 42.5 tonnes in Australia, while a truck and trailer could haul 44 tonnes and 50 tonnes respectively. The Government had recognised the merits of increased load allowance and had started a trial programme but the forum wanted faster progress. "We're looking at about a three year programme, this is after seven years of looking at it," Friedlander said. "So basically our patience is running out on that." A more efficient load allowance and road charges system could half the difference in operating costs with Australia, he said. "It's time the Government focused on helping to create the framework for the transport sector to operate more efficiently rather than imposing higher and higher compliance costs." * Operating costs are much higher in NZ than Australia. * Road user charge systems waste up to $100 million a year. * Load restrictions are limiting efficiency. * Extra costs passed on to businesses and consumers.